2. Screw shut -off valve ( B ) into 1/4 " 90 degree elbow ( A ). 3. Screw 1/4" MPH x 3/8" adapter ( C ) into valve. 4. Dig or slit trench (10" deep) to gaslite location for Gasflex tubing ( G ). 5. Slip copper tubing ( D ) into ( C ) fitting and curve copper tubing to conform to trench. 6. Connect 3/8" copper to 3/8" Gasflex tubing using 3/8" union connector ( E ). Install copper tubing into compression nut. Seat tube support ( H ) into Gasflex tube. Install Gasflex tubing into other end of compression fitting. Push tubing all the way into compression fitting before tightening nuts. adapter (not supplied in kit). 8. After posthole is dug, set post in, pour cement and level (do not cover tubing hole on side of post. 9. Connect 3/8" Gasflex to 1/4" copper tubing using union connector ( F ). Cut Gasflex tubing to proper length. Seat tube support ( H ) into Gasflex tubing. REQUIREMENTS. Avoid painting Gasflex tube. 10. If no leaks, back fill all open trenches. 11. 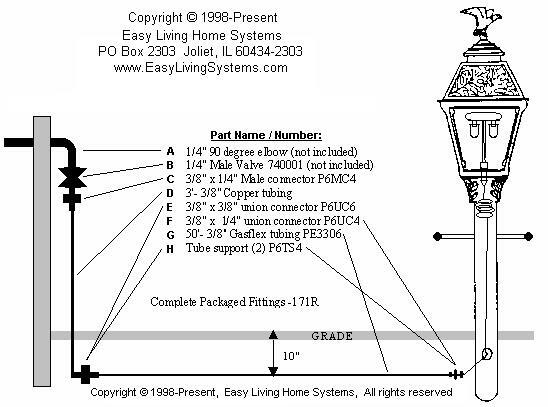 Turn gas valve on at gaslite, and follow directions to light mantles.